They’re calling it an economic Armageddon. The end of civilisation as we know it. The day the last drop of oil dries up. Goodbye cars, cellphones, and computers, virtually anything plastic or electronic. Imagine life without a ballpoint pen. While the past year has given us images of oil wells seemingly to burn, Clare Swinney investigates reports that oil companies are preparing for the beginning of the end just six years from now. It’s old news. The world is running out of oil. So what? It won’t affect us in our lifetimes. Or will it? In the last 5 years, a Waikanae builder has been acting as prophet and campaigner, fighting for the truth to be told. Auspiciously his name is Robert Atack. Atack has spoken on radio talk-back shows, glued up hundreds of posters and distributed thousands of leaflets to people on Wellington streets, in an attempt to warn us of what our future will hold. A former petrol-head, he loved riding a petrol-guzzling 1000cc Honda (VF 1000F-2) motorbike at breakneck pace — as fast as 255k/hr, and amassed $3000 worth of speeding fines in 3 years. However, the malleable 45-year-old speed-junkie jettisoned life in the fast lane when he became aware of some pressing ecological issues. Metamorphosizing, and teaming up with a like-minded Palmerston North resident, Bruce Thomson, he co-founded RunningOnEmptyNZ, a group which focuses on ways to alleviate the severe consequences expected to eventuate when cheap oil is no longer available. Atack also established the web site: www.oilcrash.com and embarked on lobbying politicians. Five years on, and after spending $4000 of his own money, the embattled crusader, who’s known to rub people up the wrong way with his brash manner, has confronted numerous MP’s, some face-to-face, including the Prime Minister, Hon Helen Clark. Atack says he aims to smoke them out and get them to officially acknowledge in the public arena, what petro-geologists have been warning us would happen for over 40 years. It’s symptomatic of our consumer age that Atack is warning people of what is old news to many in the oil industry, but not well known to society at large. The Green Party has been vocal on the matter. It was “extremely” so in the 1970’s, but New Zealand was not ready to listen, according to co-leader, Jeanette Fitzsimons, who believes that people are more receptive now. Indeed, the world is near the end of an era: the end of the non-renewable fuel age is on the horizon. Throughout the globe, 4 barrels of oil are being used up for 1 barrel discovered, while demand continues to increase. The situation is looking bleaker and bleaker, particularly given that China, which has a population of 1.29 billion, is acquiring huge quantities of crude oil in a mad dash to industrialise — its consumption rising 109% in the last decade. And during the same period, South Korea’s usage rose by 78% and India’s by 68%. World renowned expert, Dr Colin Campbell, who’s been studying the domain of petro-geology for 40 years and is one of the founders of the Association for the Study of Peak Oil and Gas, predicts that oil production will peak between now and 2010. He bases this prediction on petroleum research and the work Shell Oil’s former geophysicist, M. King Hubbert, who predicted in 1957 that U.S. crude-oil production would peak between 1966 and 1972. It actually did in 1970. Campbell, in conjunction with other analysts, (refer the web site for the Oil Depletion Analysis Centre at www.odacinfo.org, www.oilcrisis.com and www.peakoil.net ) believes that nearly 50% of the total global resource of recoverable oil has already been produced and within the next decade shortages of cheap oil will ensue. In addition, research indicates the world’s natural gas output will peak between 2020-2050, and decline thereafter. Evidently, we humans face an elementary choice. We can continue down the existing path of rising oil consumption, trying to secure the available remaining oil supplies — if necessary by military force — but obviously without avoiding dissipating what oil remains. Or we can convert to renewable sources, such as wind and solar energy and ascribe to more stringent standards of energy efficiency, weaning ourselves off oil, gradually. This will require governments with foresight to take action and the gumption to initiate energy saving strategies on a grand scale. The dilemma with this is that it’s political suicide to tell voters they have to tighten their belts. According to American ecologist, journalist and lecturer, Richard Heinberg, who authored The Party’s Over — Oil, War and the Fate of Industrial Societies (2003), we are heading for political turmoil, as leftwing-rightwing politics is unsuitable to deal with the social consequences of oil depletion. He contends that the rightwing position will prove untenable, for when the advent of oil shortages is upon us, there will be limits on resources and the trickle down from the very wealthy to the poor will not result in there being ‘enough for all.’ Similarly, the leftwing will be proven wrong if they believe decisions made democratically will lead to everyone getting their fair share. No one in government is going to want tell the public the facts in Heniberg’s view. And he concludes that we need a new kind of government — an “eco-government”: one that will not squander energy and money trying to hide our problems, but one that is grounded in reality, one that will halt growth and put the foundation in place for a sustainable future. For people in a consumer - driven society such as New Zealand, debilitating oil shortages are an extraordinarily difficult reality to face. Advertising chants urging us to buy the bigger 4WD vehicle, the better furniture, the more advanced computer and so on, have resulted in us buying the false notion that the world’s resources are limitless, as Industrialist economics recognises no limits on the utter absurd notion that growth will be never ending. Cooling realism and commonsense tells us that coal, oil and gas are not unlimited. And that our capacity for economic growth is directly related to the availability of cheap and plentiful natural resources. Consequently, according to energy resource specialists, it’s imperative we prepare now for the upcoming energy downturn. As Sociologist William Catton Jr wrote in his book Overshoot (1980), the world’s population exploded during the creation of what he terms “phantom carrying capacity.” Phantom carrying capacity is carrying capacity formed through exploiting the benefits of oil, natural gas and coal in all aspects of life, including the production and transportation of food. The world’s population was fewer than 1 billion in 1800. It soared from 1.6 billion in 1900 to more than 6.3 billion today, owing largely to the benefits of non-renewable fuels, some of the most significant of which ane not readily apparent. All of the following products contain oil: computer bodies and keyboards, printers, telephones, toilet brushes, drink bottles, stereos, TV cabinets, fridge linings, umbrellas, clothing, ink, wire, crayons, enamel, cellophane, antiseptics, vacuum flasks, deodorant, pantyhose, anaesthetics, syringes, heart valves, hearing aids, artificial limbs, skis, carpets, epoxy paint, upholstery, tape cassettes, video tapes, motorcycle helmets, pillows, shower doors and curtains, shoes, electrical tape, light switches, safety glass, awnings, nylon rope, hair dye, toilet seats, denture adhesive, loudspeakers, gum boots, candles, water pipes, car enamel, credit cards, aspirin, golf balls, detergents, sunglasses, glue, fishing rods, linoleum, plastic wood, soft contact lenses, rubbish bags, hand lotion, shampoo, shaving cream, footballs, paint brushes, balloons, fan belts, paint rollers, luggage, antifreeze, toys, floor wax, sports car bodies, tyres, unbreakable dishes, toothbrushes, toothpaste, tents, hair curlers, lipstick, ice cube trays, electric blankets, tennis rackets, drinking cups, house paint, eyeglasses, life jackets, car battery cases, insect repellent, refrigerants, glycerine, plywood adhesive, cameras, bandages, dentures, mops, ballpoint pens, boats, nail polish, tape recorders, curtains, vitamin capsules, putty, percolators, insecticides, fishing lures and nets, perfumes, shoe polish, petroleum jelly, tap washers, food preservatives, antihistamines, cortisone, CD’s, solvents, tyres, asphalt and pharmaceuticals. Virtually everything in supermarkets is either wrapped in it or contained in it. As well as giving us the freedom to travel to the other side of the globe within a few hours, heat homes, have hot showers and cook at the click of a switch, these fuels are essential to sustain today’s viable farms. For instance, pesticides are made from petroleum. Nitrogen fertiliser, a fertiliser which has enabled farms to be significantly more productive, is made from natural gas. If a soil’s supply of ammonium and nitrate ions is not replenished after each harvest, organic soil reserves of nitrogen eventually dissipate. Crop growth will then decline and be limited by the nutrients released in one year. So, modern food production is dependent upon supplementing the natural nitrogen content in soil. The nitrogen we are now dependent upon for current crop yields emanates from a procedure instituted in 1912 named the Haber-Bosh process. In addition, modern farm machinery, including the combine harvester and tractor, rely heavily on oil and there is no economic substitute for this at present. Wind, nuclear and solar power can not replace it, as many vehicles require a liquid fuel. Ecologist and leading agricultural expert, Dr David Pimental of Cornell University, who is regarded as a world authority in this sphere, estimates that approximately 90% of the energy in modern crop production is oil and natural gas. About 33% of the energy in grain production is to reduce the labour input from 500 hours per acre to 4 hours per acre. And approximately two-thirds of the energy is for production, of which about one-third of this is for fertiliser alone. If the fertilisers, partial irrigation, (which is in part provided by oil energy) and pesticides are withdrawn, corn yields, for an example, would drop from 130 bushels per acre to about 30 bushels. A very large proportion of the world's population now depends on food from high agricultural yields achieved by the use of fossil fuels. 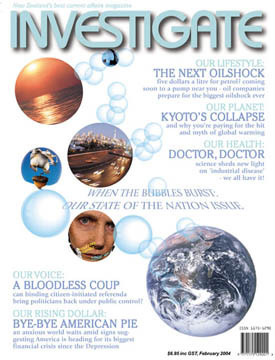 According to an analyst of global oil and food supplies, Brian J Fleay, who wrote The Decline of the Age of Oil, (1995), and is an Associate of the Institute of Sustainability and Technology Policy at Murdoch University in Western Australia, the world may only be able to support a population of 3 billion without this input. The principal grain exporters are the U.S.A., Canada, Europe, Australia and Argentina — and all are highly dependent on petroleum-based industrial agriculture. New Zealand soils tend to be acidic, low in phosphate, sulphur and some trace elements. Obviously, without fertilisers, our soil would not be capable of supporting the current number of animals grazed or crops grown. A drop in agricultural production would result, perhaps having a devastating affect upon our economy. When United Nations (UN) experts stated in December 2003 that the human population will increase to 9 billion by 2300, they neglected to take the impending impact of loss of non-renewable fuels into account. If they had done so, they would be reporting population estimates for 2300 that were a fraction of today’s total, according to energy resource specialists. Hundreds of thousands have already died in North Korea since 1994, partially owing to a dependency their farmers developed on oil and natural gas. The country’s farmers abandoned their traditional methods in the 1950’s and 1960’s and began using chemical fertilisers, pesticides and motorised agriculture, becoming more productive in the process. Trouble struck however, when in 1990, the Soviet Union collapsed and North Korea’s energy supply was cut off. While there were additional contributing factors for the low agricultural yields, such as droughts, addiction to oil resulted in the North Korean’s being more vulnerable to starvation. According to the July 2003 New Zealand Energy Data File from the Ministry of Economic Development, oil and natural gas accounted for 63% of New Zealand's total primary energy supply for the year ended March 2002 and 2003. Given that cheap oil shortages loom on the horizon, it is lamentable New Zealand’s transport system is still so highly dependent upon it. In 2003 the number of vehicles on New Zealand roads rose on average by 270 per day. According to the LTSA, at the end of 2003, there were 2.8 million licensed vehicles and data from 2002 indicates that only about 0.008% of the vehicles on the road were categorised as powered by electricity; the huge majority being petrol or diesel powered. Green Party co-leader, Fitzsimons, who has worked for 30 years in the sustainable energy field, says the oil depletion issue has driven much of their policy work, such as the recent Transport legislation moving towards much greater use of public transport, rail, cycling and walking, as much higher oil prices are anticipated. It seems illogical that in spite of the knowledge of oil depletion, in our biggest city by far, Auckland, with a population exceeding 1,291,000, authorities are poised to encourage addiction to it by installing more roads at a cost in the billions of dollars. According to the Government’s Energy Data File, in 2002, transport consumed 42% of a total of 773 Petajoules of consumer energy. According to Atack, this clearly indicates a focus on electrified rail systems and living, working and transacting locally, rather than travelling long distances by petrol-powered car, would significantly help to curtail non-renewable resource usage. New Zealand has one oil refinery: Marsden Point at Ruakaka in Northland. The overseas companies own it: Caltex, ExxonMobil, Shell Oil and BP. Presently imported oil accounts for about 93% of the total of hydrocarbons processed there -7% being derived from a Taranaki field that is due to close in about 2007. We will thus be relying on imported oil completely in about 4 years time. RunningOnEmptyNZ’s Bruce Thompson suggests that as cheap oil supplies in the world run low, New Zealand’s geographic isolation and lack of importance in the world stage, may strangle fuel imports and global trade and essentially enslave us to oil companies. On a more positive note, it is perhaps fortunate New Zealand doesn’t possess oil resources that other countries would instigate a war over. Heinberg argues persuasively in The Party’s Over that the current US-led invasion of Iraq is ultimately about oil. The Bush administration, according to Heinberg, knew about the predicted world oil peak through its access to oil-insiders, and acted to secure Iraq, which has the second largest oil reserves in the world, before another nation got there first. Interestingly, this contrasts with what the UK’s former Minister for the Environment, Michael Meacher, recently wrote for the Financial Times, (4/1/2004) : "….. The reserves in the world’s super-giant and giant oilfields are dwindling at an average rate of 4-6 per cent a year. No more big frontier regions remain to be explored except the north and south poles, where the cost of extraction will be tremendous. The production of non-conventional crude oil has already been initiated at enormous cost in Venezuela’s Orinoco belt and Canada’s Athabasca tar sands and ultra-deep waters. Yet no major primary energy alternative can replace oil and gas in the short-to-medium term. The implications of this are mind-blowing, since oil provides 40% of all traded energy and no less that 90% of transport fuel. But not only are the motor vehicle and farming industries dependent on oil, so is national defence." The UK, like New Zealand, is heading on a collision course with nature. Britain’s oil imports overtook their exports 4 months ago and UK motor industry figures for 2003 show that UK motorists bought a record number of new cars. In the years to come it will be interesting to know how many of these end up abandoned, as oil prices escalate. Atack and others argue there’s a big storm brewing for the world’s carbon-based economy that our leaders should prepare us for. Unlike the dramatic and genuinely surprising oil shocks of the 1970’s and 1980’s, this one is unequivocally evident on our forecaster’s radar screens. For the moment, New Zealand farmers in their flash John Deere tractors can still snigger at their primitive counterparts in the Third World. Give it a couple of decades though, and we could all be joining them.